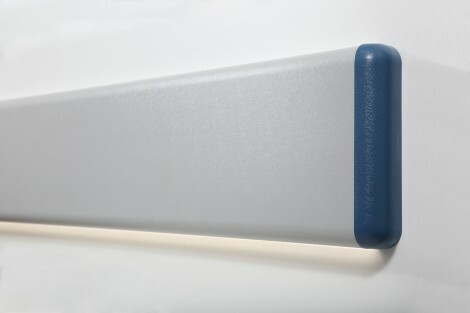 Wall guard PC200A-LED with 200 mm height, consisting of a sturdy continuous substructure that supports the entire height of the external profile for the entire length of assembly. The substructure, made of extruded aluminium, is fixed to the wall with pairs of blocks that ensure a solid seal on any material that constitutes the wall. The substructure is covered by an extruded polymer profile of Ethyl 7045 ET Teknedil with the following characteristics: thickness 2-2.5 mm, coloring in the mass of the product, surface in embossed view, homologation of the Italian Ministry of the Interior with BS2D0 class according to the European standard EN 13501 according to the Italian DM 10-03-2005 (implementation of regulation EU 305/2011); homologation of the Ministry of the Interior with fire reaction class 1 (Ministerial Decree 26/06/1984), absence of bacterial growth and mold growth, material resistant to the main products for cleaning and sanitizing environments, characterized by high impact resistance and high elasticity. Ethyl 7045 ET Teknedil polymer contains no heavy metals. The assembly of the cladding on the substructure is interlocking without the use of other devices; the central part of the substructure is supported by a support of elastic material that gives greater solidity and elasticity to the system. The substructure has a rail to install a LED light. The rail with the LED light is closed with track that diffuses light. Excluded: electrical system and LED light. The product is part of the regulation for construction products (EU 305/2011), in compliance with Legislative Decree 106 of 16/06/2017, the material is accompanied by the required documentation of the DoP and the CE label. Ideal solution for wall protection and designed to guarantee excellent impact resistance thanks to the continuous substructure, the LED option is ideal solution to light corridors at night, to mark courses or evacuation routes.